Every day, hundreds of people sit down with their dabbers in hand, with hopes of winning it big at Oshawa’s Red Barn Auditorium. For the past half-century, customers of the charity bingo hall have been enthusiastically yelling out “BINGO”, and proudly collecting their winnings. But the daily games or ‘sessions’ as those in the know call them, also help to raise funds for more than 40 local charities. Among the organizations that receive monies from sessions at the Red Barn are the AIDS Committee of Durham, Oshawa Kicks Soccer Club, and Oshawa West Lions. Frank Sobil, president of the Red Barn Charities Association, says the amount of money charities receive depends on the number of sessions a they host in a month. On average, charities will receive between $5,000 to $25,000 per year. 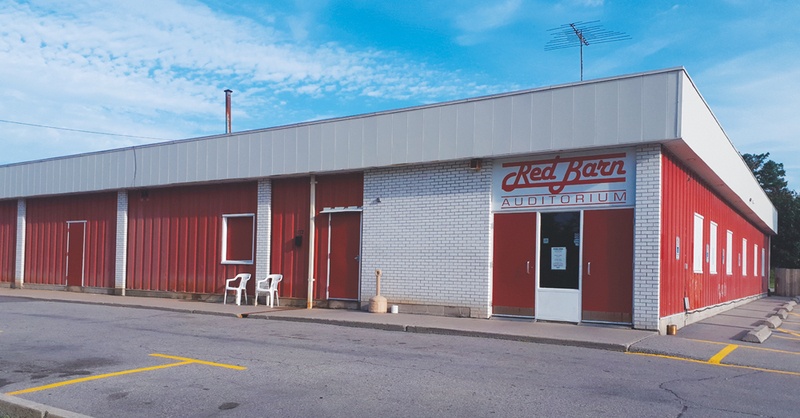 The overall history of the structure known as the Red Barn goes back to the 1930s, but it vaulted into prominence in the 1950s and 1960s under the ownership of Harold Reddick. While bingo games were present, the venue was best known for its country and western dances. “When it was a dance hall, the place was famous,” states Joe Kondyjowski, who owned the Red Barn from 1991 to 2010. Famed Nashville acts of the time such as Johnny Cash, Minnie Pearl, and Marty Robbins were some of those who performed at the iconic venue, and people from all over, but especially Oshawa, flocked to the Red Barn. “You got to remember where it is now, it was cow fields. When people from Oshawa drove up to the Red Barn, they were going into the country,” Kondyjowski says. In the late 60s, the big name performers became less and less frequent. In 1973, the original wooden structure burned to the ground from a fire started by a lit firecracker being tossed on the roof. It was rebuilt in 1974, and Reddick continued to operate the business until the mid-1980s when he sold it to Steve Hidvegi, who owned it until Kondyjowski took over. Once taking over, Kondyjowski did away with the dances and focused strictly on bingo. He noted when he took over there were a number of bingo halls in Oshawa. “Right here in Oshawa, there was the Jubilee Pavilion, Bingo Country, and Caesar’s Bingo Palace in downtown, which is now a roller-skating rink,” he recalls. In his days, the crowds, and in turn the amount that could be doled out to charities, were much larger. Eventually, the Red Barn emerged as the lone game in town for a number of factors, but Sobil and Kondyjowski both think the main culprit was the introduction of casinos into Ontario. “It was a question of who was going to survive, and whoever the best promoter was going to be,” Sobil says, adding the changes to Ontario’s smoking regulations also had an effect. And while attendance has never fully rebounded, and they don’t expect it ever to approach peak business again, Sobil and Kondyjowski both believe bingo is a better bet for those who want to play the wagering game. “With the attendance that they are getting, and the number of sessions they are having, you’re chances of winning big money at the Red Barn are way higher. No doubt, it’s way better,” Kondyjowski says. Sobil says jackpots can reach up to $10,000. A problem facing the Red Barn and other charity bingo halls are limited resources for advertising. However, those who kept coming back have shown their loyalty is fierce. And once the game begins, things can get quite serious. “You better not talk too loud, it’s like a library in there once the game starts,” Sobil says.